Life of Count Basie continues the Jazz movement to Kansas City. Basie was a real "cool-cat" who had a suave style, fast smile and quick twinkle in the eyes. 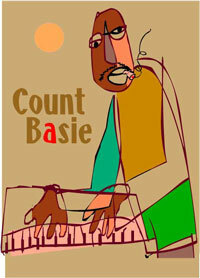 Count Basie was a jazz pianist, organist, bandleader, and composer. Widely regarded as one of the most important jazz bandleaders of his time. Basie led his popular Count Basie Orchestra for almost 50 years. Other musician cats would work in his band, learn the ropes and then set off on their own. Some cats got famous under his direction, including tenor saxophonists Lester Young, singers Jimmy Rushing and Joe Williams. 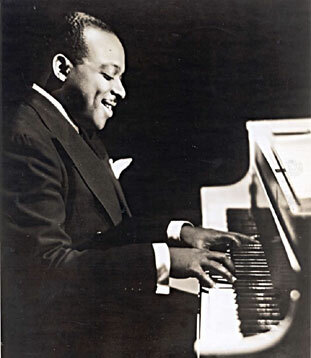 Basie's theme songs were "One O'Clock Jump" and "April In Paris". It was cool to watch him, and it seemed so effortless the way he played. Basie was a fine showman as well. The cat looked so cool dangling a cigarette on his lip as he played piano! Count Basie was one of the founders of the "BIG BAND SOUND". The cat was good at controllilng large numbers of musicians to play his music. Downbeat said, Basie “has managed to assemble an ensemble that can thrill both the listener who remembers 1938 and the youngster who has never before heard a big band like this”.